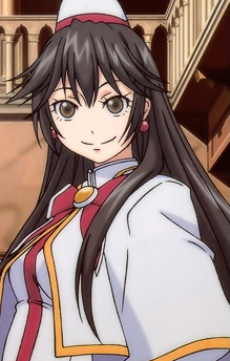 Akira is one of Neo Venezia's three Water Fairies, and is Aika's supervisor with the Himeya company. She is nicknamed the Demon Instructor for her strict training regimen as well as her loud and brusque personality. She is particularly harsh with Aika, in spite of the fact that the girl is her employers' heir, though she does so since she honestly thinks that there is potential in her. As such, she is the only Himeya employee who does not fawn on Aika, though even the latter admits that it is only due to Akira's strictness (and honesty) that she has been able to become a good undine. As a prima undine, she is known as "Crimson Rose" (真紅の薔薇). Akira is famous for her conversational skills as well as her intimate knowledge of the sights to be seen in Neo Venezia. She has a lot of admirers among her customers, though surprisingly enough these are more female than male (which seems to bother her a little, as she considers herself very feminine). Akira and Alicia's relationship mirrors Akari and Aika's, though Alicia is far more teasing when Akira is around. This isn't that much of a surprise, as Akira and Alicia are childhood friends. However, Akira is still galled that Alicia became a Prima earlier than her, despite the fact that Alicia initially became an undine to tag along with her.